Stacy Juba has written about reality TV contestants targeted by a killer, an obit writer investigating a cold case, teen psychics who control minds, twin high school hockey stars battling on the ice, and teddy bears learning to raise the U.S. flag: she pursues whatever story ideas won’t leave her alone. 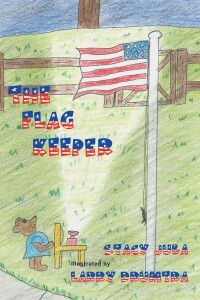 Stacy’s titles include the adult mystery novels Sink or Swim and Twenty-Five Years Ago Today, the children’s picture books The Flag Keeper and the Teddy Bear Town Children’s Bundle (Three Complete Picture Books), and the young adult novels Face-Off and Dark Before Dawn. She is also the editor of the essay anthology 25 Years in the Rearview Mirror: 52 Authors Look Back. She is a former journalist with more than a dozen writing awards to her credit. My husband is very patriotic and has always had an interest in flags. We had a flag pole installed after moving into our house, and I was surprised when he raised the American flag in the morning and brought it inside at night. I asked him why he didn’t leave it out all night and he introduced me to the concept of flag etiquette. I researched flag etiquette and discovered lots of details that I didn’t know – for example, the U.S. flag should never touch the ground, and sunrise to sunset is the proper time to fly the flag unless it is lit up at night. Schools teach about the history of the flag, but they don’t seem to teach kids about flag etiquette. There seemed to be a niche to fill. My father did whimsical illustrations of teddy bears which added a whole other dimension to the story.